Want to impress your friends at the next hockey game? 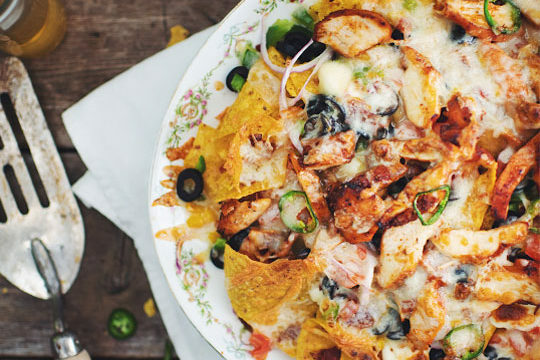 These supreme nachos with BBQ chicken are the solution !!! It’s decadent, it’s finger food and a big cold beer is strongly suggested to accompany them. In a bowl, add the spices for the dry rub and mix. Place the chicken in an airtight dish, pour about 1/2 cup of dry rub and close the dish. Shake well and reserve in the fridge for 1 hour. Preheat the oven to 375°F. Cover a baking sheet with parchment paper. Place the chicken breasts on the baking sheet and place in the oven. Bake for about 20 minutes, or until the internal temperature is 165°F. Cut into strips and set aside. 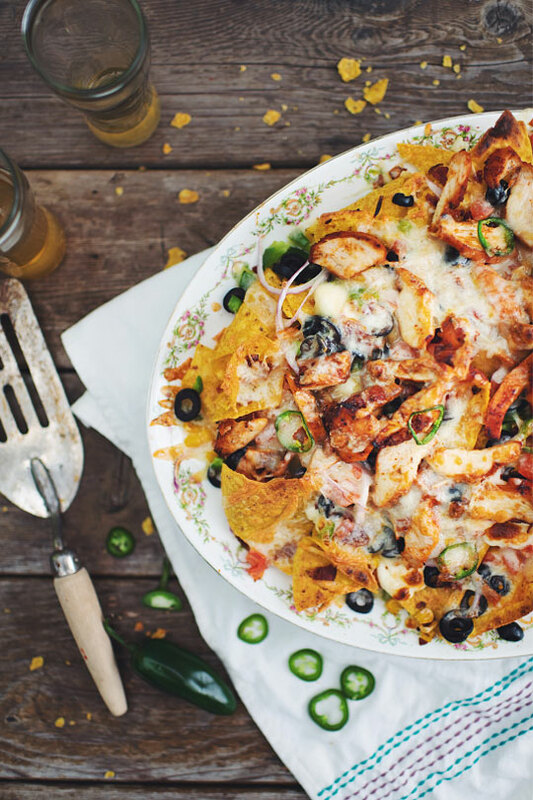 In a large presentation plate (or large baking sheet), pour half of the tortilla chips followed by a little bit of salsa. Add half of the cheese curds, corn, olives, pepper, bacon, tomato, onion and cheddar cheese. Add the remaining tortilla chips followed by remaining cheese curds, corn, pepper, olives, bacon, tomato and onion. Add the rest of the salsa, the chicken followed by a few slices of jalapeño pepper and cover with the rest of the cheese. Place in the oven and cook for 10 to 12 minutes. Change to BROIL continue cooking until cheese is melted and lightly golden. Serve with sour cream and guacamole! I LOVE the mondeuse from Savoie! A variety that has peppery notes with a soft texture. The type of wine we drink while watching the game, with nachos! 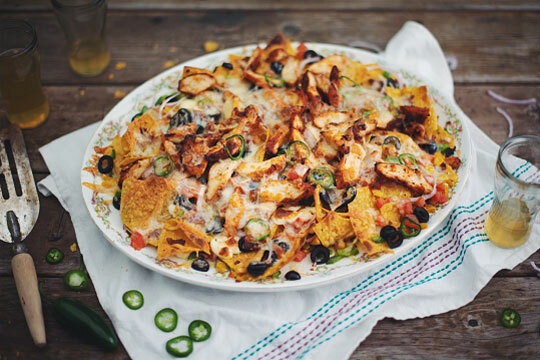 Try this surprising pepper amber ale to give your nachos a little something. Despite the taste of butterscotch and pepper flesh, it won’t be too strong. Peppers help the body to produce endorphin, so you will feel better with each bite! It’s science!